Book hotel rooms online with us at Hotel Apartamento Balaia Atlantico at the lowest rate, guaranteed. Get a holiday discount room rate at the 4 Star Hotel Balaia Atlantico Apartments located slightly inland and to the east of Albufeira in the Algarve. The hotel has 138 one-bedroom holiday self-catering apartments which accommodate either 2 or 4 persons. All the air-conditioned rooms have balconies with views over the swimming pools or gardens and are equipped with kitchenette, bathroom, satellite TV and safe. 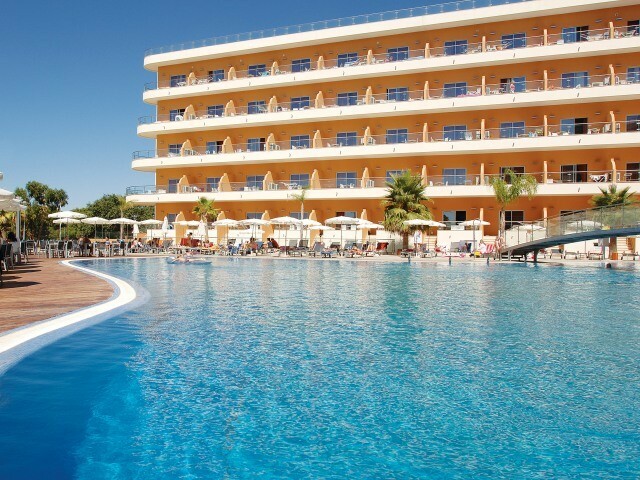 Aparthotel The Balaia Atlantico Apartments in the Algarve have many facilities including, a restaurant, bar, snack-bar, shops, Fitness Centre, Games Room, Massages, Jacuzzi, Billiards, Hot Tub, a indoor pool and outdoor pools, tennis court, mini-golf and a Kids playground.